On the run from his family, Quentin d'Arcy has settled in San Diego with dwindling funds and the growing suspicion that his gifts might not be limited to telekinesis. When he meets a psychic who can control people's actions with a few words, his comfortable life starts to unravel. Laurence Riley almost died killing one god only to discover that he's descended from another. Before he can come to terms with that revelation, Quentin's twin brother walks into his life, and there's no way to know what his motives may be. With great power comes great danger. Kane Wilson wants to make a better world: a world in which psychics are open about who and what they are without fear of reprisal or hatred. With the power to control others, he might be able to pull it off, but there's going to be collateral damage. If Quentin and Laurence can't get to the bottom of Wilson's plan, Kane will out the existence of psychics not only to San Diego, but to the world, and all hell will break loose. 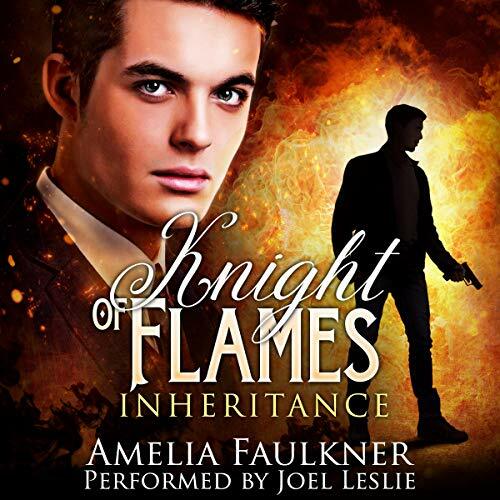 Knight of Flames is the second audiobook in the Rainbow Award-winning Inheritance series and contains mature themes and events that may be distressing to some listeners. It has a mild heat rating and an HFN ending. I LOVE this series by Amelia Faulkner and I was so excited to see it on Audible. I've read it a ton of times and now I can listen to it over and over. can't wait for the next one! Once again Amelia Faulkner delivered a fantastic reading experience, with even better pacing and all the care and attention to detail in regards to the characters and their developing relationship that enchanted me in the first book. In the second installment, a few months have passed since Laurence and Quentin defeated the god Jack. Laurence is dealing with his underlying fear that Quentin will leave, either because Laurence frightens him or that the suppressed and deep-seated dread Quentin has of his father finding him, which fuels his many relocations, will eventually overcome Quentin’s desire to be with Laurence. While working through the minefield that is the physical aspect of their relationship and Laurence’s worries about their relationship dynamics, Quentin meets a psychic named Kane, who runs a home for young psychics, and is asked to help the adolescents gain better control of their gifts. Although Quentin jumps at the chance to be useful and help kids who seemed to have been abandoned by their families/society, Laurence is hesitant to get involved with Kane, who has the ability to control minds and wants to eventually expose the existence of psychics. As mentioned, this book benefited from a more even pacing/storyline. The MCs have acquired more confidence in their abilities and more caution regarding strangers with powers, well Laurence has, so there is less of the hesitancy and insecurity that slowed down and added circularity to their dealings with Jack and the use of their gifts. Moreover, the story focuses on learning about Kane and his motives, which is much more straightforward than dealing with a god you accidentally summoned while fearing for your life. Unfortunately, while you learn a little more about the events that isolated Quentin and led to his flight across the pond and see some of his family dynamics with the introduction of his twin brother, Frederick, you are still left in the dark about what makes Quentin so sometimes charmingly, sometimes frustratingly naive and what happened during his childhood that did so much emotional/mental damage. Most importantly, to me at least, was that the story maintained the element that captured my attention and made me love the first book—the thoughtful exploration of the early aspects of courtship that usually get brushed aside for the “big finish” of physical intimacy. This book allows you to experience and enjoy each building block to trust and intimacy. How can you not love an engaging, paranormal story with this much beauty in it? And as usual, Joel Leslie nails the narration by taking the beauty inherent in the book and bringing it to life in his performance. How he manages to convey all the heartfelt tenderness and emotion Quentin feels for Laurence in Quentin's quiet, reserved way of speech is astounding, and I get to fall in love with these characters all over again.